This work is painted in two different styles: the earlier part, which includes the figures on the right, was probably painted in 1881-2, while the left hand side, with the foreground couple, was painted in 1885-6. This protracted period of execution is typical of Renoir's works of the 1880s, though the lack of a uniform style is unusual. Further evidence for the respective datings is provided by the different fashions of the dresses (Renoir was generally accurate in such matters in his large modern life scenes). The right-hand figures are painted in light, feathered brushstrokes, which are characteristic of the artist's earlier Impressionist style, as are the sweet smiles of the child and woman. However, the two figures on the left, modelled on Aline and Lhote, are painted in a much hatder and firmly structured manner that to some extent resembles Cezanne's planar style. The latter affected other of Renoir's works of 1885-6 and the influence of Cezanne's so-called 'constructive stroke' is especially evident in the painting of the trees in the background. Except for the more varied color scheme of the left hand foreground figures (particularly the orange of the girl's hair), the palette is dominated by cool blue tones. 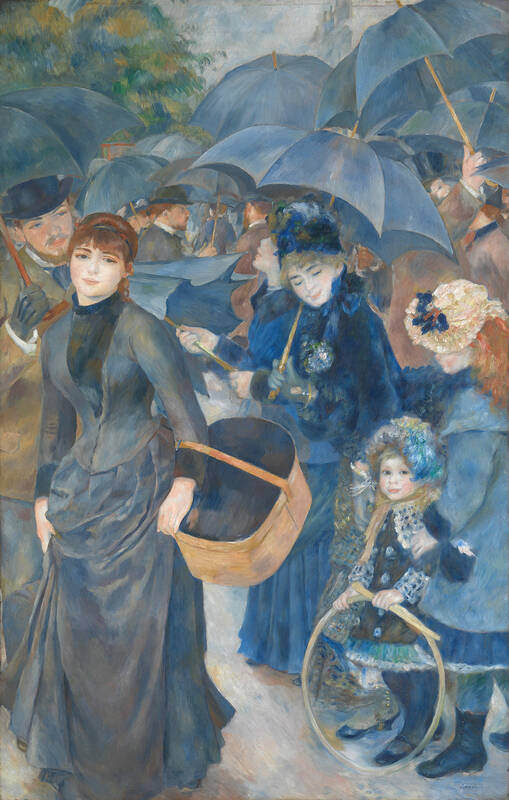 While the people in the crowd busy themselves with their umbrellas (which create a rigid structure in the upper part of the work) the young woman on the left and the child to the right both look directly out at the viewer, the former with a rather pleading expression. As they do so, the young man in turn stares intently at the woman, perhaps about to offer her the shelter of his umbrella, or maybe just admiring her. This is the last of Renoir's large scale pictures of modern life. The disparity of styles and fashions, the latter being particularly apparent to contemporaries, made the painting hard to sell. Nevertheless, Renoir was for some reason unwilling to rework the earlier parts to create a more unified image.